A strong 15-year-old girl in Mississippi named Anna Hankins has won the Miss Amazing pageant with an amazing story. A heartwarming story in Mississippi is making the rounds on social media. Anna Hankins, 15, suffers from a rare genetic condition called Prader-Willi Syndrome which gives her an insatiable appetite, causing her weight to hover around 380 pounds at such a young age, but she showed the world that she will not let the incurable disorder keep her from living her life. Hankins competed in the Miss Amazing pageant, which celebrates women and girls who have disabilities. 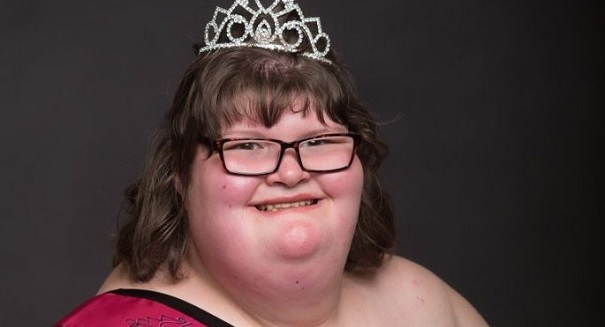 She was crowned the pageant queen recently, something that put a big smile on her face. “I love Miss Amazing. My favorite thing is singing and makeup and hair,” Anna said according to a Fox News report. This is her third event since getting involved in pageants in the fourth grade. Lori Brasfield-Sanders, director of Miss Amazing Mississippi, told SWNS that the pageant is about showing that people with disabilities have incredible value and strength. “The biggest misconception people have regarding people with disabilities is that they cannot lead full, engaging lives,” she said. “Prader–Willi syndrome (PWS) is a genetic disorder due to loss of function of specific genes,” according to an excerpt in Wikipedia. “In newborns symptoms include weak muscles, poor feeding, and slow development. Beginning in childhood the person becomes constantly hungry which often leads to obesity and type 2 diabetes.